My husband just finished his bathroom renovation. It's brown and white and masculine and oh-so HIM. You can see his bathroom HERE. I was jealous. My bathroom is perfectly lovely, but it's not that fun. I decided to make some minor changes that would make a big impact, starting with adding a "WHOA" color. Now, we already renovated this bathroom. 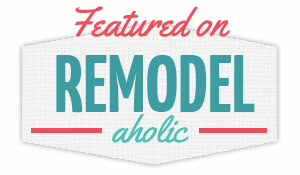 We tore down the bulkhead and completely re-did the shower with a sleek glass wall. We also added a new vanity and tiled the floors. You can read more about the previous reno HERE. Let's take a peek at my view from the bed, shall we? I made a little art piece to keep things modern. I was afraid the hot pink would go "too teenager" if I didn't keep the art simple. My favorite paper flowers are back again, and I like how they tie in the master bedroom with this bathroom. I used the same scrapbook paper that I added to the artwork in Scott's bathroom. My husband was at Lowe's one day when he spotted this wall cabinet for $13 on clearance (down from $100)! Knowing how much I need storage in my bathroom, he snatched it up for me. It really does help my storage problem, and the white coordinates well with the existing vanity. I thought it would be fun to personalize the inside of my cabinet, so I got out my white puff paint and went to work, adding polka dots and one of my new favorite sayings. It's always nice to read something positive while you're getting ready for work, right? Then I added a few of my favorite pictures to the inside, and now I feel like the cabinet was custom-made for me. LOVE it!